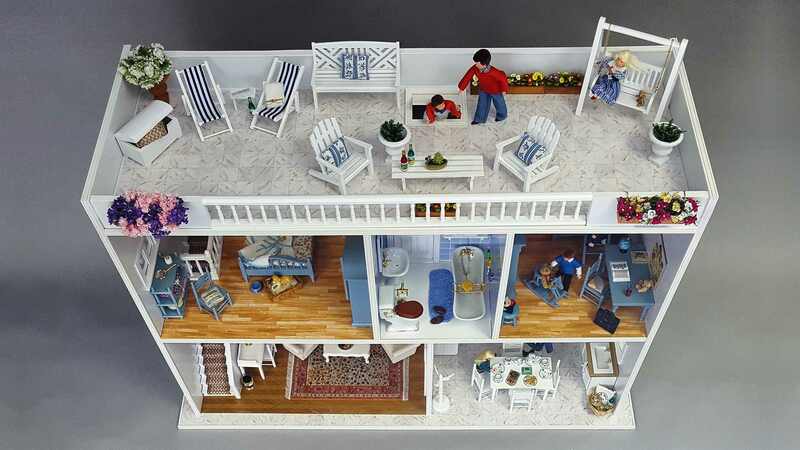 The ideal doll's house for your children and grandchildren. The wood fibre boards (MDF) are coated white on both sides. Two windows, two doors, the staircase, a roof hatch and white strips for covering the front sides of the MDF panels are included in the scope of delivery. Equipped with our beautiful ready-made furniture, it doesn't take much effort: Playin can begin! The MDF boards are only inserted into the prepared grooves and glued together with the supplied wood glue: Done! Recommended age: 4 years up to 99 years. Furniture kits: from age of 14 years.